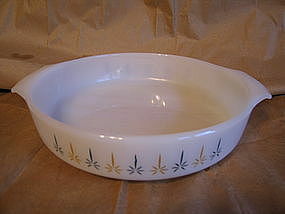 Vintage round cake pan marked Anchor Hocking Fire King Ovenware 9 inch 429 21. There are no chips, cracks, breaks or rough rim. It shows some usage marks and several normal Fire King anomalies to the glass. I need your zip code to calculate the postage.